The case of the “Ground Zero Mosque”—that is, for those who’ve been on Mars for the last few weeks, the Islamic Cordoba House that is to include a mosque, along with an auditorium, a swimming pool, art exhibition spaces, bookstores, and restaurants, though it is not to be built at Ground Zero, but rather, two blocks away—continues to prove highly teachable, as the academy likes to describe topics amenable to Socratic or other instructive dispute. But the dispute hasn’t yet finished granting its gifts. Critics of the Islamic center haven’t taken their own premises seriously enough, and the defense of the mosque has stopped too soon. Stare into the cauldron of the dispute and you see American values boiling. Opponents of Cordoba House, from Sarah Palin to Abraham Foxman’s Anti-Defamation League, believe that what ought to prevail are the emotions of survivors and others: some survivors and some others. Sensitivity rules. Former Governor Palin declared, in a tweet that went around the world, that the determining force is pain that “stabs hearts” “throughout the heartland,” pain that is “too raw, too real.” Mr. Foxman’s words were more modulated: “[U]ltimately, this was not a question of rights, but a question of what is right." But he too went on to specify an emotion-based conception of “right” when he went on to say that the anguish of the families of those murdered on September 11, 2001, “entitles them to positions that others would categorize as irrational or bigoted." For Mr. Foxman, emotion is also the anteroom to morality. One way or the other, Mr. Foxman and former Governor Palin would seem to agree that the rights of survivors—family members—are self-evident. Anyone who cannot feel for them forfeits a human impulse. For their losses, there can be no recompense. But just what are their rights, and where are their limits? In a democratic society in which feelings do not automatically line up around a single magnetic pole, questions immediately arise: Which hearts? Which heartland? Which survivors get to decide? How many widows are worth how many cousins? Does the pain of those of us who lived near the Twin Towers and inhaled the stench of the burned flesh and the smoldering ruins for weeks, but (or therefore) conclude that a nearby monument to civilized discourse about religion makes a great deal of sense, avail nothing? Are the courts to judge the respective realness or authenticity of pains? Elected officials? Congress? In this brave new world order, feelings would be enforced by the might of the law. This way lies the sort of touchy-feely madness that, not too long ago, conservatives considered political correctness run wild. But beyond the question of whose feelings count looms a principle that needs stating: Private feelings do not convey public rights. It’s in keeping with the spirit of an age hostile to public values that some survivors—and some who share their view of propriety—can be considered to have the last word. If some survivors of Timothy McVeigh’s victims wish to erect a sculpture next to the Murrah Building in Oklahoma City depicting McVeigh strapped on a gurney receiving a lethal injection—perhaps next to the two pints of mint chocolate-chip ice cream that made up his last meal on earth—would that be their right? (I have not been to law school, so perhaps I may be excused if I say that this is, indeed, a self-answering question.) Or should we suppose that a poll (or focus-group? focus-assembly?) of survivors is to prevail on the question? Questions of principle remain. To permit the feelings of some survivors, however deep, however inconsolable, to trump all other considerations is to view the massacre of September 11 as their private affair. But it was not that. It was perpetrated against the body of America—indeed, the world, since the victims were citizens of many countries. (At that, scores of them were Muslims, a number greater than the number of hijackers—not that this matters in principle.) Al Qaeda considered them fair game not because of any wickedness that might adhere to their own persons but because they happened to occupy certain sites on the American earth, and because, in their view, the destruction of these sites would serve their purposes in the diabolical theater that terrorism amounts to. George W. Bush was right about this on September 13, 2001: They hate our values. In other words: Nothing personal. The proper reply is: Osama bin Laden has his views of what public life is for, and we have ours. His stem from a vicious interpretation of Islam. Ours are rooted in the American Constitution. But even those, like Reuel Marc Gerecht, who wish Imam Rauf to swear a sort of loyalty oath affirming that he is sufficiently “moderate” (and to keep his answers short), do not allege that he wishes to enshrine Al Qaeda. But, although his views are beside both the constitutional and statutory point, they are a legitimate subject of inquiry. At least, they have come to interest me. Readers who do not find such matters interesting are excused until the following subhead. Some accuse the Imam of having made certain shallow or unwise pronouncements in the days after September 11. Now, there are a couple of quotes the Imam made then that strike me as sloppy. The roll is long of people, some quite distinguished, who failed to express themselves well, or even decently, in those horrible days. But to rake through their interview remarks plucking out rotten cherries, without even going to the trouble of reading the extended works in which they have stated their own views, when they were answering their own questions in their own time and not the questions of reporters caught on tape, is not serious. I claim no scholarly credentials bearing on Islam, nor have I crossed his path (though see Jeffrey Goldberg, below), nor do I have access to intelligence files on him. But I do thank Mr. Gerecht for having spurred me to borrow from the Columbia University library both of Imam Rauf’s books that they own—appropriate, I must say, if for no other reason than that Imam Rauf holds a college degree from the university where I am honored to work. Mr. Gerecht believes that only “someone who unqualifiedly renounces the applicability of the Sharia, the Holy Law, in American society” is entitled to a certificate as a “moderate Muslim American.” He challenges Imam Rauf to declare where he stands on the “traditional Muslim understanding of orthodoxy as orthopraxy (it’s not what you believe in your heart—that is between you and God—but how you act, i.e., apply the Sharia, in the public square that matters).” He will be happy to know that Rauf devoted pages 101-104 ten years ago—I daresay long before he imagined he might need to trim his sails to repel accusations that he fronts for mass murderers—to precisely an idea of Shari’ah that considers intention to be of the essence in judging the lawfulness of an act. The final chapter before his appendices is called “Can the Shari’ah Evolve?” to which his answer is the sort of “yes” that all but the most fundamentalist adherents of any religion at all would defend. The Imam follows an intricate and adroit line of reasoning. He is thoughtful and at times—at least for a nonbeliever—tortured. From a strictly secular point of view, he makes impermissible moves. In short, he recommends the kind of reasoning that, in another context, would be called Talmudic, in the manner of every serious theological work I’ve ever consulted. But enough about Imam Rauf. Mr. Gerecht wishes to put someone in charge of vetting religious sites in America (or, perhaps, just in the “sacred ground” of Lower Manhattan; it’s not clear how far the boundaries stretch). 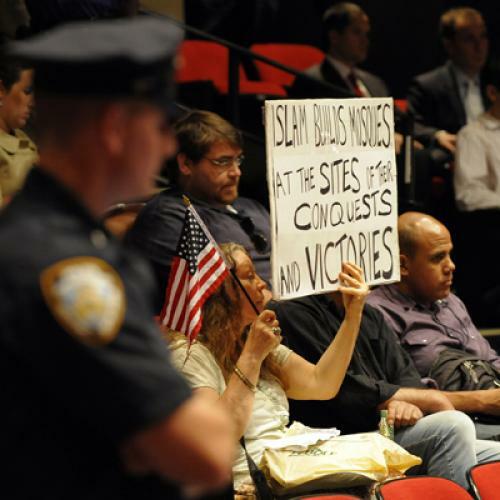 The New York landmarks commission will not suffice, for it voted last week, 9-0, to reject concocted landmark status for the undistinguished building that will have to be knocked down to build the Islamic center. Mayor Bloomberg would seem to be a duly constituted authority, but he’s declared himself clearly: “If somebody wants to build a religious house of worship, they should do it, and we shouldn’t be in the business of picking which religions can and which religions can’t,” he said, responding to Newt Gingrich, who had declared, “There should be no mosque near Ground Zero in New York so long as there are no churches or synagogues in Saudi Arabia.” Why mosques ought to be permissible twelve blocks from Ground Zero, where Imam Faisal Abdul Rauf currently preaches, the former speaker of the House did not specify. Nor did he seem to be aware that Muslims mark Ramadan, prayer rugs and all, within the walls of the Pentagon itself (courtesy of Justin Elliott at Salon.) True, only 184 Americans died in the Pentagon on September 11, 2001. But is nothing sacred?If Joe McCarthy were alive, he’d be subpoenaing generals already. Of course, if money from the same sources who fund Al Qaeda comes into the hands of Imam Rauf (and, for the reason Mr. Goldberg writes, this would seem on the face of it highly unlikely), there are ample laws against money-laundering, and buildings full of intelligence officials devoted to smoking out the illicit transfer of moneys that have passed through the hands of evil men. It is the public duty of American governments to enforce the Constitution. It is not their public duty to prohibit constitutionally protected activity on the ground that bad people might donate to it. Wall Street Journal columnist and former Bush speechwriter William McGurnagrees that the controversy should impel the Imam to relocate. On this line of argument, the ferocity of his enemies ought to trump his intentions, however noble. Whenever controversy erupts, the angry get an automatic veto. This is Tea Party logic—of the Mad Hatter variety. But I do not want to conclude on that note. As Imam Aruf would say, peaceable intentions should count in behalf of these men—as also for Governor David Paterson, who, at the eleventh hour, came through on August 10 with an offer of state-owned property (odd on constitutional grounds, if no others) if only the developers would hark to the project’s opponents and relocate Cordoba House farther away. The impulse toward reconciliation is decent, but toward reaching that happy outcome, not everything is permitted. The America that offers the world an ideal of religious coexistence does not benefit when a cultural center is officially bribed to move out of bounds. To depart the realm of legal and theological considerations: Thus does Cordoba House, like a biochemical stain, continue to reveal vast and hitherto obscured reaches of our American life. Todd Gitlin is a professor of journalism and sociology and chair of the Ph.D. program in communications at Columbia. His next book, The Chosen Peoples: America, Israel, and the Ordeals of Divine Election (written with Liel Leibovitz), will be out in September.